Reach Out and Read© is a national program which prepares America’s youngest children to succeed in school by partnering with doctors to prescribe books and encouraging families to read together. This early-literacy program focuses on children 6 months – 5 years old, trains and supports medical providers who give books to children at well-exams, and provides advice to parents about the importance of reading aloud. 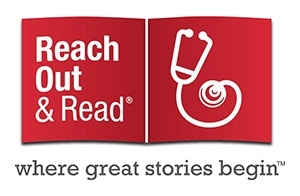 Reach Out and Read® builds on the unique relationship between parents and medical providers to develop essential early literacy skills in young children via the existing healthcare infrastructure. During regular pediatric check-ups, pediatricians, family physicians and nurse practitioners give new, developmentally-appropriate books to children and advise parents about the importance of reading aloud every day with their children. As a result of this evidence-based intervention, parents learn new ways to stimulate their child’s literacy development, have more books in their home, and read to their children more often. Parents are supported as their child’s first and most important teachers, and children grow up to become readers. Your donation to Reach Out and Read, Orange County will help us support our early literacy champions, and expand the program across the county. Your generous contribution will go to purchase new children’s books, educational resources for parents, and other resources to support and enhance early literacy programming in Orange County. Your $20 donation will support the cost of providing books to one child per year. Your $100 donation will support 5 children or 1 child from 6 months through 5 years with a new set of age-appropriate books of their own. There are multiple ways to support Reach Out and Read, Orange County. Host a local book drive in your community, school, church, or place of employment by collecting new and gently-used books which will go directly to one of the many Reach Out and Read Orange County pediatric clinics. Below are resources to get you started. For questions, speak to Emma, our Reach Out and Read coordinator at (949) 752-2787. The first five years of life offer a critical window for learning, with rapid brain development that does not occur at any other time. Many children, especially from low-income families, are not read to from birth. Children who grow up without sufficient exposure to language arrive at school without basic literacy skills, and often struggle with reading in early grades. Each year, Reach Out and Read® serves 4 million children across all 50 states, focusing on those in low-income families. As of January 2013, 6.5 million books have been given out by 12,000 medical providers, at 5,000 program sites in all 50 states and D.C. Learn more about this evidence-based intervention. AAP-OC is the regional coordinator of Reach Out and Read in Orange County. Our program currently assists 70 pediatric clinics and 178 physicians in the implementation of Reach Out and Read in their practices. Reach Out and Read, Orange County serves over 65,000 children per year, giving out over 34,000 new books annually. To date, we have distributed over 606,000 books to children 6 months – 5 years through the Reach Out and Read Program. If you are interested in learning more about the impact Reach Out and Read© has had since 1989, here is their 2017-2018 Annual Report. To read about what it takes to add this Program to your practice, read this attachment. And, if you would like to join Reach Out and Read, Orange County as a participating site, complete the online Application and Letter of Support. Utilize these resources in your office to encourage donations of new and gently-used books. For questions, contact our Reach Out and Read coordinator, Emma at (949) 752-2787. Video from Get Ready to Read! Reach Out and Read’s well-known chart, MILESTONES OF EARLY LITERACY DEVELOPMENT, offers information – in an easy-to-read grid – on the developmental stages (both motor and cognitive) that lay the foundation for learning to read. Targeted to ages 6 months through 5 years, the MILESTONES include tips and guidance for healthcare providers, parents, and caregivers on choosing books and reading aloud to children at different ages. Download the chart in English here. Download the chart in Spanish here. South Coast Pediatrics #3-Ball Rd.